I really enjoyed this narrative told from the point of view of a thirteen-year-old girl whose life changed forever on the morning of the Pearl Harbor attack. Rose is part of a military family recently transferred to Oahu from San Diego, California. She is missing her friends and still adjusting to life in Hawaii. Her father is assigned to the USS Oklahoma. Rose has an older brother, Lee, who constantly harasses her. She is spending the morning sketching the boats in the harbor. After a morning spent with her new neighbor, Leinana, a meeting up with a Japanese classmate, and an evening of music competitions, the stillness of the following Sunday morning, is broken by an aerial attack. Suddenly, life on the island is shattered. Rose, her family, and neighbors are placed in terror mode. Families wait to hear about their loved ones, the Japanese are rounded up. No one knows whom to trust and communication lines are broken. The author does a wonderful job of portraying the fear, uncertainty, and human suffering, as well as developing the humanity of the individuals that are affected by the tragedy. I would certainly recommend the book to young adult and adult audiences. The author targets the book for audiences age nine and older. 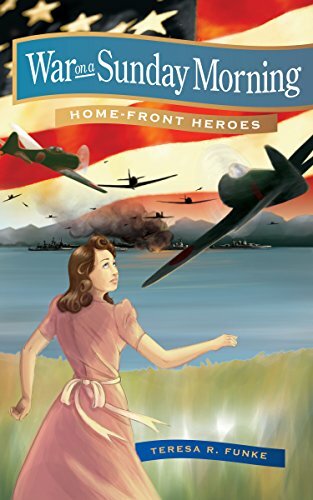 This book would be an excellent choice for homeschooling parents or teachers of World War II history.